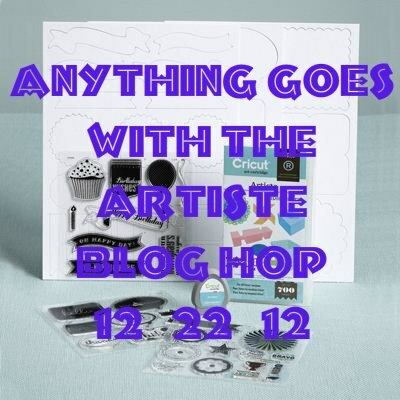 Welcome to our "Anything Goes with the Artiste" Blog Hop where we are showcasing the exclusive Artiste Cricut cartridge which can be purchased exclusively through a Close to My Heart Independent Consultant. This will be our last Artiste blog hop for 2012. Our "theme" for this hop was to create anything we wanted with the Artiste Cricut cartridge. And honestly, you can pretty much create anything and everything with the Artiste so this was not a difficult thing to do. If you came here from "Penny's" blog, It Makes Total cents, then you're in the right place! A set of coasters! I was trying to think of a project to make that could be used as a last minute Christmas gift, when it dawned on me.. My friend Katt makes trivets using her cricut and 12x12 floor tiles.... I don't have vinyl, but I have paper and 4x4 tiles that I had purchased for some long ago project. Here is a picture of the supplies that I used for my project. The only thing missing in the pic is the foam brush and the paper I used. I chose a Mod Podge that is for tile, wood and other objects that could be used for furniture. Oh, I almost forgot the felt dots! I used these on the bottom for the feet so the tiles don't sit directly on the table and scratch it. For the image on my tile, I decided on the suits from a deck of cards. 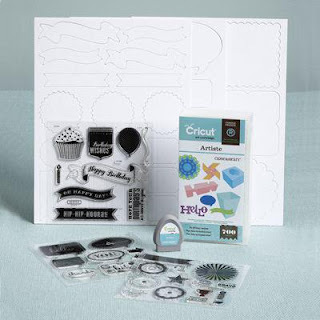 These were cut out at 3 1/2, and they can be found on page 49 in the cutting booklet. After cutting out the images, I inked them using a sponge dauber and White Daisy ink. To glue them to to tiles, I used my foam sponge to put some Mod Podge on the back of the paper, and then placed the paper on the tile. MAKE SURE that when you do this, you get the paper where you want it. It won't move once it's placed. These have to dry for a couple of hours before I can add a top coat to the tiles to make them waterproof. I am the last stop on this hop. Thanks for joining us - have a wonderful and safe holiday with your friends and family. What a great idea! These are great! I can see many images applies to tiles thanks to your info. Didn't know there was a special mod podge for stuff like that. Live and learn. Charlotte, I did not realize it either! Not until I went to the store and saw the different bottles and started reading them. Thank you so much for stopping by! I will have to make those for my mom! She is a bridge player and these would be terrific for her! Thanks for the great idea! What a fun idea! Your tiles turned out great, and your idea for the set was so creative! Thank you everyone for the nice comments.